At the weekend, there is one place I love to go in the city. It's also the one place I always tell anyone to visit if they are coming to Belfast for the first time. I'm of course talking about the iconic St. George's Market. Over the past number of years, there has been a huge regeneration of the market with a mix of really interesting food and funky items on offer along with the traditional fruit, vegetables, meat and fish that the market is well known for. One of my favourite stalls to visit at the market is run by my friend Jeff. His amazing designs called "Belfast Times" (yes, the same man behind the blog!) are always such fun. Inspired by Andy Warhol and typography, his prints feature classic Belfast sayings, legendary people and buildings. They look beautiful framed as a gift. I also love the cards which make the best gift! Let me know what you love to visit at St George's Market below or by tweeting me @GemmaLEBond. If there is one iconic place in Belfast, it's the City Hall. Well known for it's blue roof, the City Hall is home to the Mayor, daily weddings, civil ceremonies and at Christmas, the Continental Markets. I was walking a few weeks ago to meet a friend and parked at the back of the City Hall. I realised how under appreciated it is! From the back, the building looks so European and governmental. Business in the back, party in the front as they say! I also love the outfit I am wearing in this shot. It goes so well with the flowers. My shirt is from Replay, trousers are from Next and shoes are from New Look. It is such a fun look that would be great from work to party. I love when other creative people come up with fabulous ideas. I was recently approached by the lovely Photography by Astrid to take some snaps of my favourite Belfast locations. I have divided the shots up into four different locations. I had so much fun taking these with Astrid- she was so easy to work with and make a anxious me feel much better. My first favourite location in Belfast is Corn Market. This is the little area before you walk into Victoria Square. It has always been special to me because of my regular Saturday visits to Belfast with my grandparents. Before Victoria Square existed, there was a really run down old arcade type shopping centre. My grandparents loved the furniture store in there so Corn Market is somewhere we would frequently pass by. Now, Corn Market is a hustle and bustle of people. The city has changed so much in past 10 years and the sculpture in the middle always has people waiting on friends, playing music or eating their lunch. There are so many cool shops in the surrounding area- Dr. Martens, Joules, Jigsaw, Jack Wills, Kiehl's... and that's before you even go into the shopping centre. My outfit consists of a Topshop top and scarf, Next trousers, H&M sunglasses and a bag that was a gift from my mum. Stay tuned as I share the rest of my favourite Belfast locations shot by Photography by Astrid. I've never written a blog post about a person before and their role in my life. But tonight as I sit on my sofa, drinking a Lemsip with a throat that feels like glass, I've been reflecting on the life of Joan Rivers and how her life made an impact on me. The phenomenon of celebrity is strange. The fact someone can touch your life without ever meeting them is odd. I never got to see Joan Rivers live. I was once in Vegas and missed her performing by a day. I was also too young to see her when she came to the Ulster Hall here in Belfast. If any of my blog readers have met me in life they will know I have a really big, larger than life personality. My friend recently described me as a walking, talking cabaret act. And that I am. All hand gestures and "darling" and "fabulous". There is a big bit of my personality that has definitely come from watching Joan Rivers whilst growing up. Even as I child I recognised how exuberant and over-the-top she was. I just thought she was divine. As I got older, I understood and laughed at her dirty jokes. 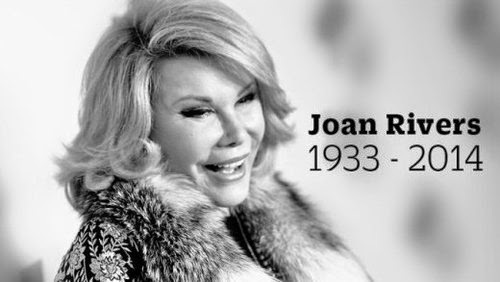 Her humour was often controversial but she said she made fun of things so people could make sense of them and deal with issues. Her own sad times- her issues with her body image, her husband's suicide became part of her act and a coping mechanism. My personality, although huge, isn't all truly 'me'. And I suppose that's a huge part of me being a blogger. I am hugely showbiz. I've sang since I was five- what do you expect? When we were teenagers my best friend frequently couldn't cope with the two sides of my personality- this hilarious, smiley girl in front of her friends but quieter, more thoughtful and emotional when I was alone with her. My blog has hugely repaired my relationship with her. I get to be the big personality at events and in meetings. It is that confident girl that my blog is built on. It was that big personality that allowed me to stand at Stormont and speak in front of crowds about what is was like to have depression. Then I came home, got into my PJ's and I was the normal, emotional girl making a cup of tea and crying about what I had just told hundreds of people. Joan Rivers taught me not to have fear. To be ballsy. To swear when it's required. But ultimately, she taught me to have confidence in myself. The old saying "Fake it till you make it" is so true. As I sit here tonight in a week where my anxiety has literally had me in convulsions, I remember Joan and that sometimes, a girl just has to pick themselves up and keep on going.